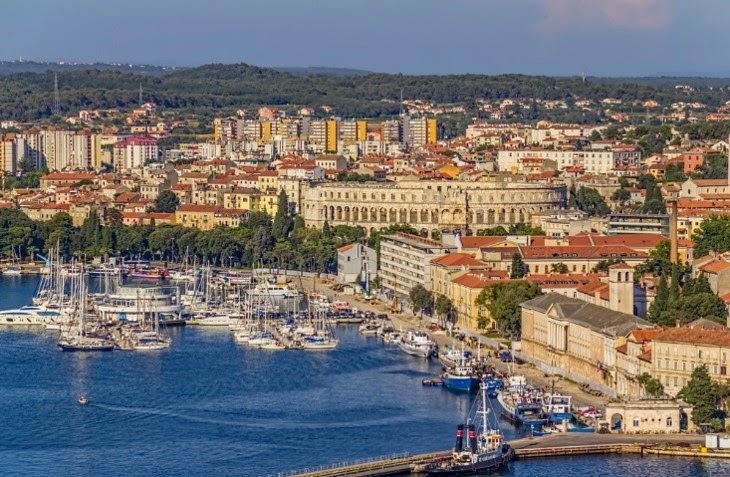 Almost at the tip of the Istrian Peninsula, the town of Pula busily goes about her industrial day amid first century Roman ruins, Byzantine churches, Austrian forts, and water so stunningly blue that it mesmerizes with every glance. Still, Pula is not the quaint, charming, relaxed town of her Istrian sisters. She is hard working and industrious, busy fishing, building boats, and in general, making a living. Pula still has much to offer the patient visitor, however. Her roots run deep into history. The nearby Cave of Sandaja is the site of a Paleolithic find of Homo erectus inhabitants from a million years ago. Following in those footsteps, hill forts containing tools and jewelry of the Proto Illyrians marked the coming of the Bronze Age. Ruins from the first century, such as the incredibly intact arena, and the Augustan Forum, provide reminders of a period of Roman rule. The city was destroyed once, in the midst of the Roman area, and once by an invasion of the Ostrogoths, eventually giving way to Byzantine, Austrian, Italian, and Yugoslavian rule. It's no wonder that the people of Pula speak so many languages in addition to their own. A reflective day spent exploring the city's past easily leads to an evening spent enjoying the area’s finest wine, seafood, olive oil, and delicious black and white truffles. Pula is the largest city in Istria. It's situated at the southern tip of the Istria peninsula, with a population of about 60,000. See Best of Istria Google Map for additional recommendations of places to see and things to do in Pula.